WHEN A SNOW-STORM THREATENS (and there is a mighty one brewing here in the Northeast just now), I always pray that the power won’t go out. But I’ve learned not to panic when it does. 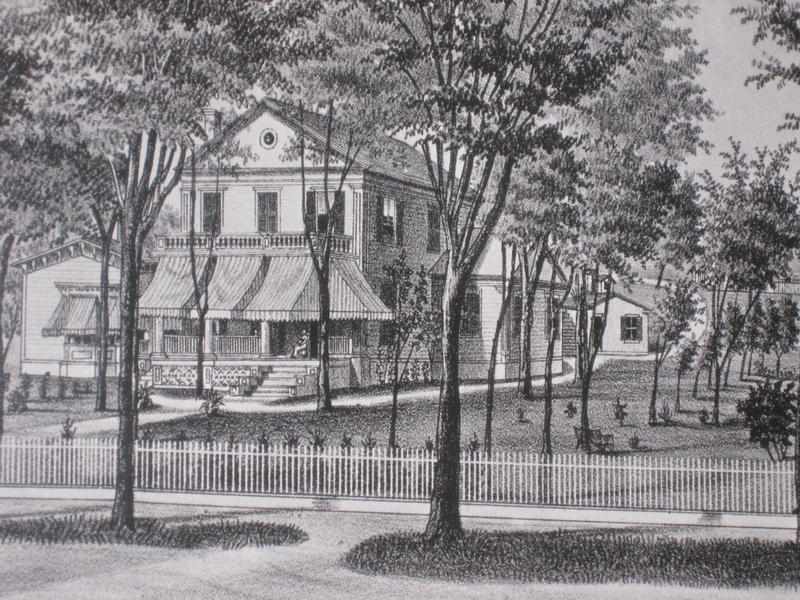 For I live in a house that was built in 1826, long before electric outlets or generators were known. Would you like to see how my partner and I stay warm, well-fed, and yes — even entertained — when our modern appliances fail? Back in December, 2006, when the power went out for 5 days, I learned a very important fact: The early-19th century occupants of this house did not freeze in winter. 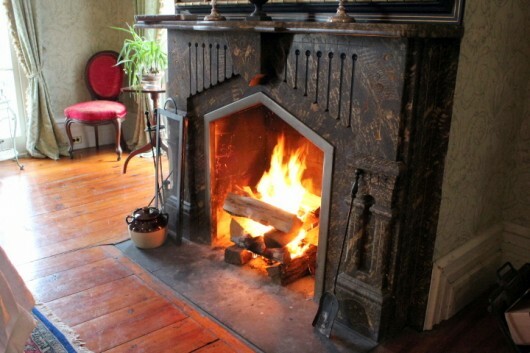 Indeed, the fireplace in the parlor (above) heats the room quickly and efficiently. I think the shallow firebox — typical of all Federal-era fireplaces — is responsible for the rapid production of ambient heat. When the power goes out, we camp out in the parlor, reading books and playing Scrabble by firelight and candlelight. Of course, a power-failure is the perfect time to enjoy Afternoon Tea. 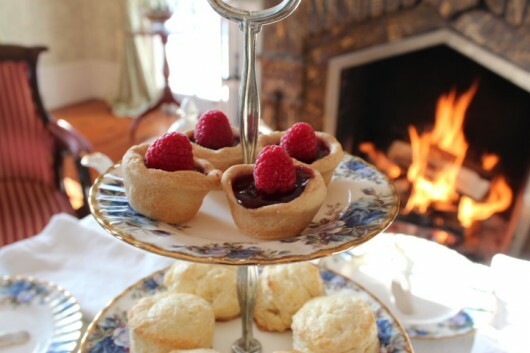 I can tell you that tea and scones are particularly delicious when consumed in the warmth of a roaring fire. 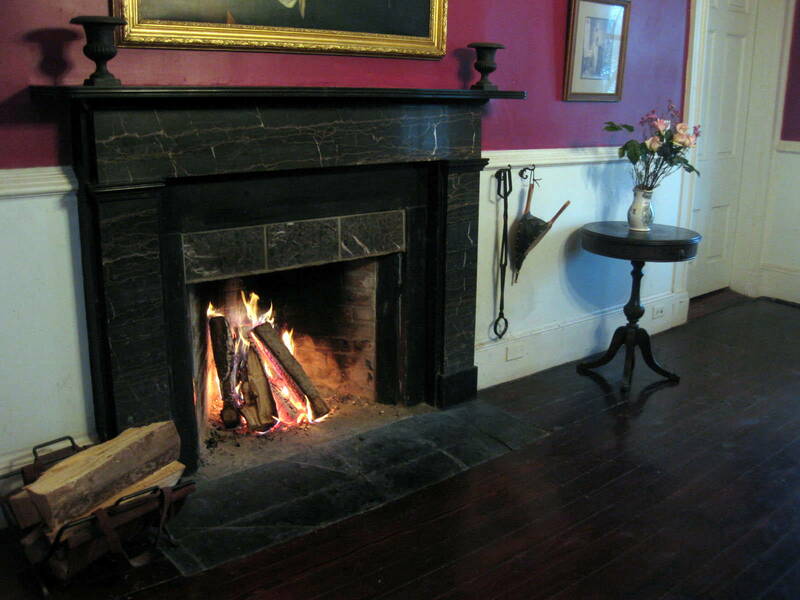 A “Rumford” fireplace keeps the dining room warm. Count Rumford, a tinkerer and British loyalist (he fled the United States after the Revolutionary war), discovered that a firebox with angled sides produces more radiant heat than a straight-sided box. And he was right. With only five pieces of split wood, the dining room turns toasty-warm in only 30 minutes. We host dinner parties whenever we want — electricity be damned. 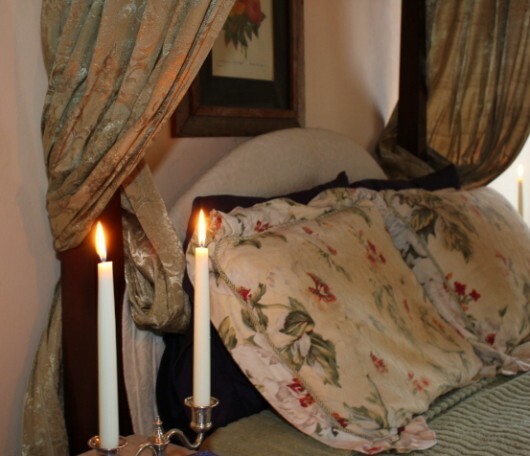 To light the room, I arrange candles on the sideboard. The mirror over the sideboard reflects and thus dramatically amplifies the candlelight. Upstairs, yet another fireplace heats the bedroom. Whether the power goes out or not, I like to light a fire just before going to bed. It takes the chill out of the air until I get settled under the comforter. 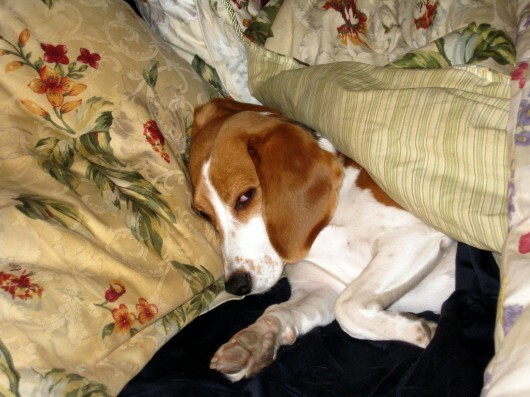 My favorite comforter is Lily the Beagle. Actually, Lily enjoys the fire, too. Often she will settle on the long sofa that stands at the foot of the bed, and before the fire. She’s a wise girl. 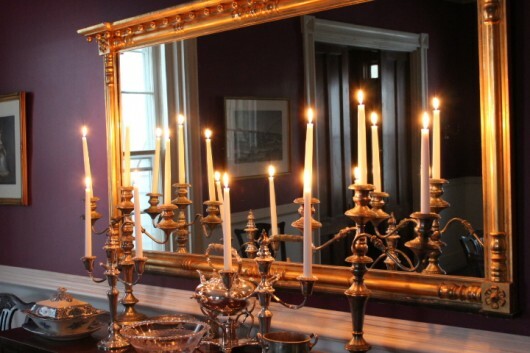 Candelabra, placed on the mantel and reflected in the mirror, provide enough light for me to dress in the morning (I rise before the sun does) and to undress at night. Without electricity, one has no choice but to read by flashlight or candlelight. As you can see, I prefer the latter. 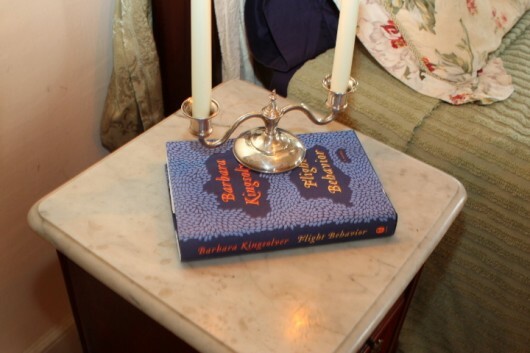 And if you are in need of reading material, whether by daylight, electric light, or candlelight, I can highly recommend Barbara Kingsolver’s latest novel, Flight Behavior. I may very well offer this book as a giveaway. Let me know if that appeals to you. As for cooking, I rely on the fireplaces. 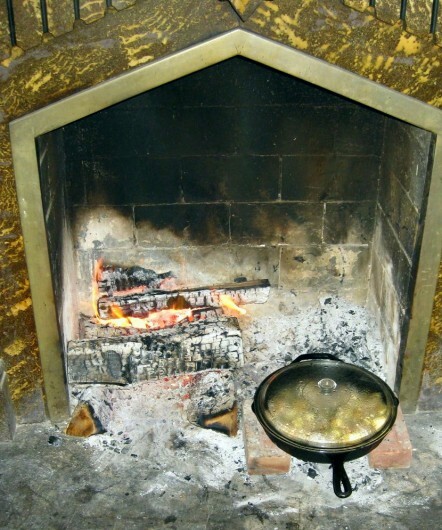 Above, at the parlor fireplace, I’m cooking Chicken with 40 Cloves of Garlic in a cast-iron skillet. The skillet is set between two bricks, with hot embers underneath. If you have a fireplace, you can cook anything and everything on its hearth. I’ve baked a quiche in a Dutch oven set over hot embers. I’ve also roasted whole potatoes, onions, and fish fillets by burying them under a pile of hot ashes. Folks, open-hearth-cooking rocks! Of course, during a power failure, you can’t while away the hours watching cable TV, DVDs, or Roku. But if you spent your childhood learning how to play the piano — I did — then the question of entertainment is solved. For a piano requires no electricity whatsoever. Consequently I can entertain myself or my guests (but only if they ask), with some of the finest music in the world. 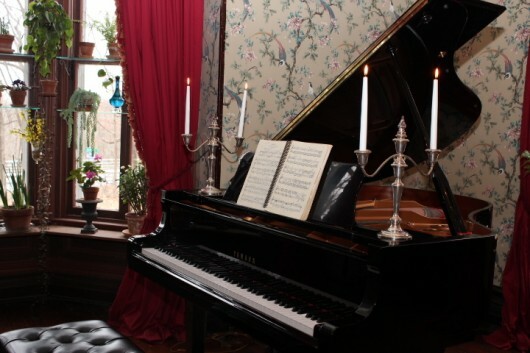 I simply place a pair of candelabra on the instrument to light the printed music. You know, like Liberace. YES…I would love to read Barbara Kingsolver’s latest book! Your home is charming! To tell you the truth, I’m having a fit of storm envy right now. It’s been a long, long time since I experienced a wild snowstorm, the last being in 1978 in Doylestown, PA. We moved away the next year and it rarely snows here. I would love to have such a home to spend a few electricity free days. Fireplace cooking does indeed rock! Take lots of pictures of the house bedecked in snow! What a peaceful retreat you’ve created. It just glows with love. I adored Animal, Vegetable, Miracle, but one novel of hers that my son read for school, was a bit too harsh for me. Real life harsh. I just read a blurb about it online and it sounds terrific. How are you liking it? Enjoy this wild storm, stay warm :). Love Barbara Kingsolver – devoured ‘Animal, Vegetable, Miracle”….. I am consumed with jealousy! Your home looks so cozy. I would be curled up on the couch in front of the fireplace – with Lily, a cup of tea and a good book! Just lovely! So charming and cozy. Makes one long for a time without electricity and electronic distractions. I do remember cold, blustery days and nights growing up on the coast of New England; coming in from hours of sledding with frozen nose and toes, and warming up in front of a crackling fire with a cup of hot cocoa. Idyllic. Thanks for the memories!! Looks snuggly and wonderful, Kevin. I can second the idea that the best comforters are our dogs, as my two are draped over me at the moment. We’ve gotten 30″ in our NH town so far and it’s still coming down, but the power has held. Looks beautiful! Surviving blizzards with style. And, yes to the book. Love this… such a beautiful home! There is something amazing about firelight and candles! Cooking on a fire can be tricky. I cook when I camp. Simple fare but amazingly good. I use cast iron dutch oven and make coffee the old fashioned way too. I’ve had some interesting conversations with folks downwind of my campsite. Breakfast of bacon, eggs, bisquits and coffee is one of lifes treasures when it’s prepared and eaten in the great outdoors. totally non-stick w/ every subsequent use. I swear, Kevin. You must have the best life, ever! I love reading your posts! I hope you used all of these great ways to stay warm and well fed in the last couple of days. MY GOODNESS that was/is some storm! I live in Canada, the warmest part admittedly, but I was posting pictures of my flowering crocuses three days ago. But, you house is so beautiful and cozy I wanted to be in the storm just to enjoy the warmth there! My home town has power outages every winter due to high winds and falling pine trees on power lines. Sometime for 3 days. Gas hot water still works and gas stove burners. For light we use candles and battery powered lanterns. For heat we have 3 fireplaces. I discovered battery powered fairy lights this Xmas. Tiny LED lights strung on thin wire. 2 AA batteries last 44 hours. Now i will string some up next power outage. The 20 ft strands are inexpensive on Amazon about $6 each. I would never resort to a gasoline generator. There are solar powered ones , expensive but Green technology. Been there and done that having lived in an old house with fireplaces for several years in Northern MN. It was fun and had my sister-in-law and her three kids sleeping in the living room that had a fireplace as their modern home was no place to be. Have already read B. Kingsolver’s Flight Risk and thought it was very good and educational as well. Sounds great–but who gets to chop all that wood? I chop my own, but it seems like it takes forever. Too cheap to buy a splitter. Maybe if I heated just with wood it would be worth it. Also sounds like you don’t have a well. When power goes out at my place, there’s no water…so, no shower, no toilet, you get the idea. Am considering a propane-powered generator since I have this huge propane tank that only powers the kitchen stove! My needs are pretty simple–just enough power to keep the well pump and the geothermal system going. Then I can curl up in front of the fire with a good book and my cats and only be at the mercy of the guy with the propane truck! Do you have maids to help you take care of that big, beautiful house? I found myself longing to spend an evening, or afternoon at your home reading a book by your parlor fireplace listening to you play some tunes on the piano. Simply a lovely thought. A break for afternoon tea would be divine. Happy to hear your recommendation for Flight Behavior as I checked it out from the library this last week. I loved The Poisonwood Bible. Looks like you have no problems with surviving a storm! Hope you do a giveaway with Barbara Kingsolvers book, she’s a great author but I haven’t read Flight Behavior yet! Sounds like a good read. Ya’ll stay warm. I really enjoy your blog. Stay safe and warm! I loved “Flight Behaviour” and read it recently. It was an autographed copy which was pretty special having read every one of her books now. Your article should go on “Survivalism Sustainability” FB page! just because it is a wonderful contrast to it. I’d love to read the book! Love your home. It looks so homey and cozy. Keep the good information coming. I can’t wait to get each newsletter! Oh I miss a good wood fire, for warmth, smell and light. We live in a very remote part of the country, run our home and winter business on mostly renewable, wind energy. There are still times when something will go ‘wrong’ but that just means we need to figure out what it is and solve it. Love the pictures and great suggestions!! Also Lily the Beagle is one very smart girl!! Will have to try cooking on a hearth, haven’t done that. Stay warm and enjoy all that great living. Barbara Kingsolver is one of my favorite authors! How lovely your home is . I especially like the idea of using candles in front of a mirror to reflect light. Feels so cozy and warm! Thanks for sharing …. An old friend of mine and I used to have friendly contests in hearth cooking when we went camping. Her top win was Eggs Benedict and Strawberries in Champagne whilst mine was Duck a la Pomme (someone forgot the oranges and brought apples, so I improvised). All we allowed each other was a pit of embers, a grating top (for broiling etc.) and ONE pan! Such great fun. I too have an ancient house, but the one fireplace left has no flue and is unsafe so we don’t get to have a fire anymore…….more’s the pity. Kevin I’ve just begun to enjoy your posts and enjoy them I have! Thank you so much for sharing. I like your choice of reading material, your choice of comforter too! Be well. We had a large non-Rumford wood-burning fireplace in our home on the outskirts of Boston in front of which I would put up the clothes rack and hang the laundry to dry in front of the hearth overnight. Decided later that a Surdiac (Belgian) coal-burning stove would give us longer and more consistent heat when the winter winds would howl and the flat cast iron top on it was perfect for holding a Dutch Oven containing a pot roast or chicken with vegetables that would simmer and perfume the whole house. What a wonderful smell when coming in from the outdoors. Who says the slow food movement began in Italy?! Thanks for sharing your lovely home with all of us. I have a double fireplace and are you saying I should cook on the outer portion of the hearth rather than on the interior? Is that to avoid direct flame? I’d like to try cooking in my cast iron skillet. Oh, and yes, LOVE Barbara Kingsolver’s books. Count me in! There’s something quite awesome about fireplaces. And that’s something I know to have either installed in my current home, or when I look for my next home – a fireplace/wood burning stove! Especially for power outages… after Sandy hit my area of NJ and we had the pleasure of two+ weeks of no electricity I found refuge at my MIL’s house where she has a lovely amish cast iron wood burning stove. I made her dinner a couple of nights on it. And we were never without nice warm tea~ I’m also not a stranger to the Navy shower, so at least I would be able to take warm showers… hehe. I am really envious of the amount of mantles you have though. So much beauty in your home! I love the candles with the mirror. Never thought of that . Thanks! Mmmm, the smell of a wood fire. Alas, I have no fireplace in my little cookie-cutter ranch. For a while I tho’t of having a wood stove installed, but that would mean not one wall in my modestly-sized living room to put the couch on! Plus, I remembered that the one winter I lived with a wood stove, I suffered asthma. So…regretfully, I will just have to enjoy the tales like yours of folks who are lucky enough to have not one, but several fireplaces in their homes. And I did enjoy your post very much. I know it won’t be the same, but maybe next winter I will install a little gas log or electric fireplace just for the ambiance. But where will I put it? I guess it would look silly in front of the bay window, right? P.S. I would be delighted to read B. Kingsolver’s latest book. I just finished The Lacuna–a fabulous read! She is a wonderful writer. I absolutely love that you can make a snow storm and power outage appear so incredibly civilized! Barbara Kingsolver is one of my favorite authors. Thanks for enriching my life, Kevin. My stepfather, a generations-back Yankee, always allowed plenty of ashes to build up in his fireplace. At night, he’d shovel the ashes over what was left of a fire. That way, the fire couldn’t flare up unattended, and the coals, bedded in ash, take ages to finish burning. So in the morning, you just pull back the ashes to expose the remnant coals, add wood, and you’re back in business. Saves matches, too. Hello there! This article couldn’t be written much better! Looking at this article reminds me of my previous roommate! He always kept talking about this. I will send this article to him. Fairly certain he will have a very good read. Thank you for sharing! I have just finished reading your account of what happens when the power fails. Here is a true story….A friend and I were visiting a Russian monastery on Mt Athos in northern Greece. It was constructed with load bearing walls so the bases of the main building were very thick.. as in feet wide. Added to the scene where the windows.. I am sure there is a better word as they weren’t really windows but an area were bows and arrows or any other defense could be used .But here is the story….. I thought I could do better than that.. so with the next round I drank all the ouzo and then took my water glass and discretely let the ouzo slip back into the glass. Gross I know, but I had read that that was one method……little did I know that the ouzo turned milky in water… a sure sign I was not drinking it!….. I have other monastery stories but I will leave them for later…..
Hope you had a big block of dry ice or a generator for the refrigerator and freezer. 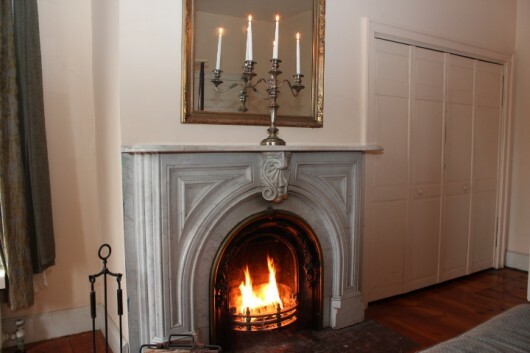 Our 1880 Victorian was built with two fireplaces, only one of which remains. But it has only one flue for the furnace gases. This was built as the “modern” house, and we have the most amazing steam radiators in all the rooms except for the el. In Maine we’re in big trouble if there is a power outage in the middle of winter. Our answer: a generator. Great advice IF you have a fireplace, but I live in an apartment and we don’t have fireplaces. Any advice for non-fireplace owners? Thanks! We quite often have a power outage, and over the years have learned to survive quite nicely. We have a generator which supplies to all, but the water tank. We cook outside on a camp stove, we have a great old fireplace that provides heat and light. We were without power for eight days, and I have to confess that got a bit old. Candles with mirrors! the last time the power went out here, I was warm enough in front of the fire, but bored, as the fire and couple of candles weren’t enough light to do much. (I’m older with poor eyesight, anyway) ……but more candles! and mirrors! I’ll be better prepared next time. 🙂 I’ll have to put the dutch oven in the emergency preparedness pile and cook something yummy next time…..
Lily looks very warm and comfy! I live in the country, so water from the well, and. IF there is NO electricity , no water, and no flushing. And, what do you do about possible freezing of plumbing pipes? Even a big fireplace and pellet stove can not warm the remote baths, laundry, etc. I find zero romance in power outages, and I have put off installing a propane generator, because of the unsightly unit and huge gas tank. Woe. Your home is so peaceful & beautiful. Even this Texas girl could assent to a winter balckout if I were holed up at your house! Thanks, as aolways, for the tour. And yes, I would love a give-away of Barbara Kingsolver’s book! I am currently reading the new book.. so far so good! Would love to have a cup of coffee while reading. 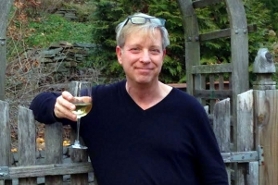 Thanks for a great inspirational blog, in the DC area we are awaiting the storm also. Your blog is a breathe of fresh air. Blessings, stay warm! Even more fun than reading Kingsolver’s book is listening to it – SHE is the reader!! And she has the perfect voice for it. Put it on your iphone or whatever, keep it charged, and when the power fails you should have enough to keep you going for awhile. As always, I love seeing your house. An enormous “yes” to anything Barbara Kingsolver. 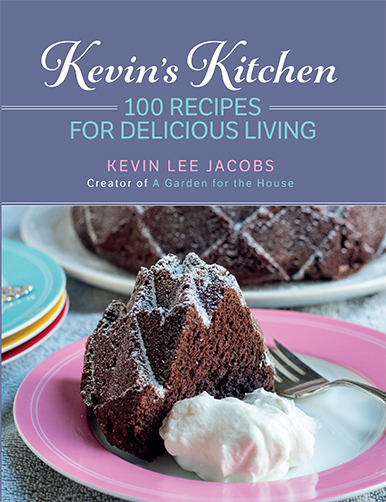 Kevin, any suggestions for cooking on a wood stove during a power outage? Best cast-iron skillet recommendations? Best type of pan to boil water for tea on a wood stove? Kevin…..thank you for today’s fact filled post. Praying for all of you today and in the winter days to come. Be warm and safe! We are having a major ice storm in the Atlanta area, and while we still have power and heat, (for now), a lovely new book to read would be a welcome addition. I do hope you are lucky enough to keep your power on, but it looks like you will survive wonderfully if not. Good luck! Thank you Kevin for the house tour – it looks beautiful! Being from the UK I would just love to visit and have tea and scones with you lol! We do have a wood-burning stove which is wonderful and cozy during these brutal winter months and I cook on the top of mine (if only my mother could see me now lol). I use a le Crueset dish to make a big pot of soup and it simmers on the wood-stove for hours! I just noticed Mary’s comments about wood-stove cooking – I also use a saucepan to boil water for tea on my wood-stove it works fine:) (During power outages). Keep all those fabulous fireplaces stolked this weekend Kevin, roll out the sleeping bags in front of the fire. You`ll have lots of snow to chill the wine ! Happy V-Day ! I also have prepared plenty of tasty repasts via hearth-cooking. I grew up on a farm so we had wood-burning stoves and one fireplace. I remember the linoleum on the floor being so cold some morning it felt like it was burning the bottom of my feet. It doesn’t take long to get a roaring fire going to warm your tootsies in that case. Would love to have a chance a winning the kettle and YES to the book as well. You have a lovely home. Stay safe and warm!! We heat with wood, so no problem when the electric goes out – as it does sometimes. Love Barbara Kingsolver and especially Flight Behavior. It would be so wonderful to have a real fireplace… I have an electric one so it would be of NO use during a power outage. I haven’t read that book, sounds good …the book give away. By the way I really enjoy your blog. We have a well so if there is no electric, then no water. That makes life challenging. Have you read Poisonwood Bible? It is my favorite B. Kingsolver book and my favorite book ever. I hadn’t yet heard of Flight behavior. Thanks for all your inspiration. I have a nice collection of winter sewn seeds outside in their mini greenhouses ready to get snowed on here in upstate NY just a wee bit north of you! We loved reading your story about the lights and that going out it sounds romantic in fact really but we know all to well what it’s like when the elec. goes out ! I have a wood stove in my fireplace because it saves from wasting heat out the chummily it in facts saves 80% so it does get warm in my little house thank god for that anyway we loved reading this to night it is very cold out side here as I am sure it is there tonight on 2/12/14 We would like to ask you a question about your home it was built so long a go is there any kind of story thAt goes with the house ? We mean have you ever found out who all lived in the house since it we built at all? Have you learned anything about the people that made the house ? We love the fire places the are old we like old things anyway we would love to hear from you about your house it sounds really something that would be good to hear more about . The past holds so many thing that would be really oil to learn more about what kind of history have you learned about your house ? Thank you for listening and cAnt wait to learn & hear more about all of this . Thank you kindly have a really safe & nice night. 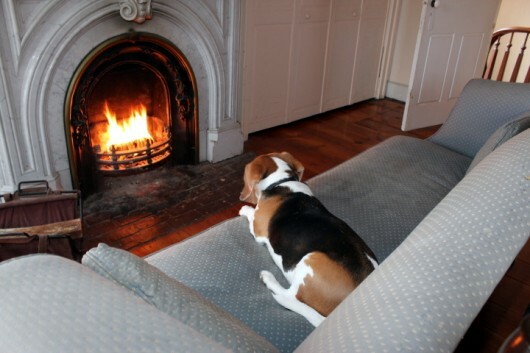 Oh yes we love your dog lily she is so cute how many fire places do you have in your home they are really nice looking fire places and it is also good that they all work. During the ice storm of 2007 here in Oklahoma we were without power for 5 days. We had the fireplace lit up in the living room and a blanket covering the entrance to the living room so all the heat stayed in. We have a sleeper sofa so we basically camped in our living room. My hubby had a wheelchair battery and he hooked up our lamp to it so we at least had light. We played a lot of games and read. Having read Barbara’s ‘Poisonwood Bible’ and ‘Animal, Vegetable, Miracle’; yes, I would love to read Flight Behavior! At this time of year reading books keeps me sane. I work for a tax preparer and I am dead on my feet by day’s end. A good book helps me unwind. Currently reading Fannie Flagg’s ‘The All-Girl Filling Station’s Last Reunion’ and will need another book to read. Really enjoyed the pics of your beautiful home. I wish mine had at least ONE fireplace. My home was built in 1949 and they forgot to put in a fireplace! Have to rely on a noisy generator when power goes out…no fun at all. I wish you’d share more of your lovely piano playing. the power didn’t stay out for too long!